French and Italian forces conducted an 81-mile combat logistics patrol with Marines on May 27 retrieve a downed French F-2000 Mirage jet in Bakwa district, Afghanistan. 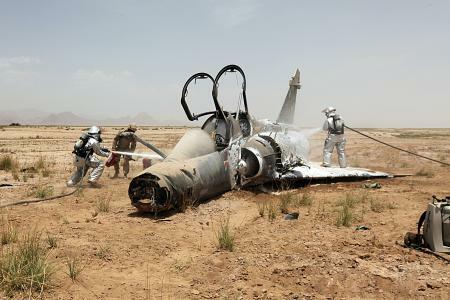 Last week, a French F-2000 Mirage jet crashed in western Afghanistan. The pilots weren’t hurt, but it raised questions about how NATO forces would recover it. The answer: Call in the Marines. As this Marine Corps news account shows, troops with several units pitched in, including Combat Logistics Battalion 8, 2nd Explosive Ordnance Disposal Company and Marine Wing Support Squadron 272. The Army’s 129th Combat Sustainment Support Battalion provided equipment for the May 27 mission, teaming with a French aircraft recovery team and Italian team. The jet crashed in Bakwa district, an area of Farah province that Marines patrolled regularly in 2009 and 2010. It now falls under Regional Command West, commanded by Italian forces, but with its close proximity to Marine bases in Helmand and Nimroz provinces, Marines in RC-Southwest were called in for the job. Marine officials said the EOD team and an aircraft recovery firefighting team with MWSS-272 worked with the French team to dismantle the jet. The wings were loaded onto an Logistics Vehicle System Replacement heavy hauler, and the body onto an M870 trailer. The news release said the Marines conducted an 81-mile convoy to get to the jet from RC-Southwest. It doesn’t say which base they left from, but based on geography, something in Delaram would make sense. Before the Corps turned Farah over to RC-West, Forward Operating Base Delaram served as a hub for operations in the province. The closest base to Bakwa is the Farah PRT. It’s probably 81 miles after you include all the winding of the roads. Good gouge, D Wylie… but if they came from the Farah PRT directly, they wouldn’t have been coming from RC-Southwest, as the Corps reported. You’re right–plus, in spite of how much the PRT has grown since my time, I doubt those assets roll from there. Good coverage–thanks. Man I like your post and it is so good and I am definitely going to save it. One thing to say the In-depth analysis this article has is truly remarkable. No one goes that extra mile these days? Bravo!! Just one more tip you can get a Translator for your Worldwide Audience.